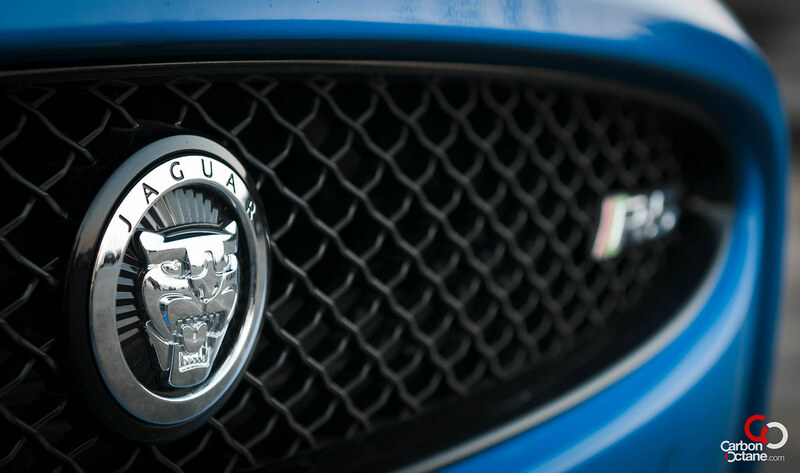 For the last 67 odd years, the brilliant minds at Jaguar had been buried deep down in an unknown bunker in Coventry, and have emptied their arsenal in building their GT segment juggernaut, the mighty XKR-S. 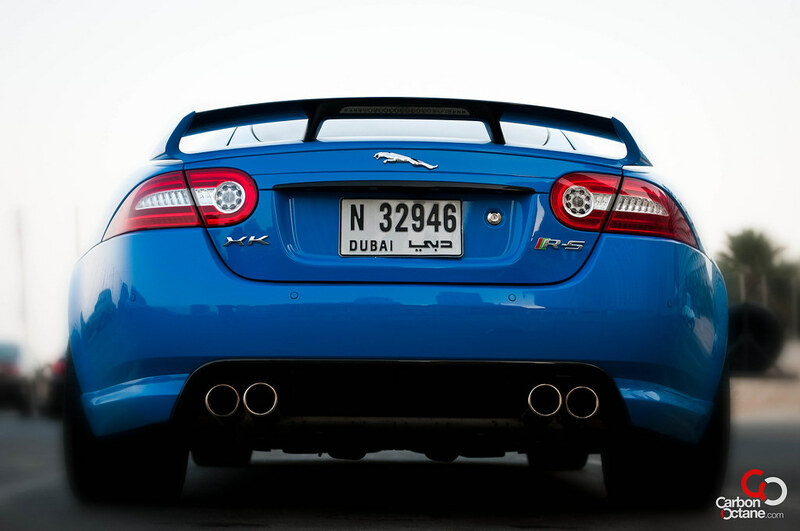 This is the fastest production Jaguar till date. 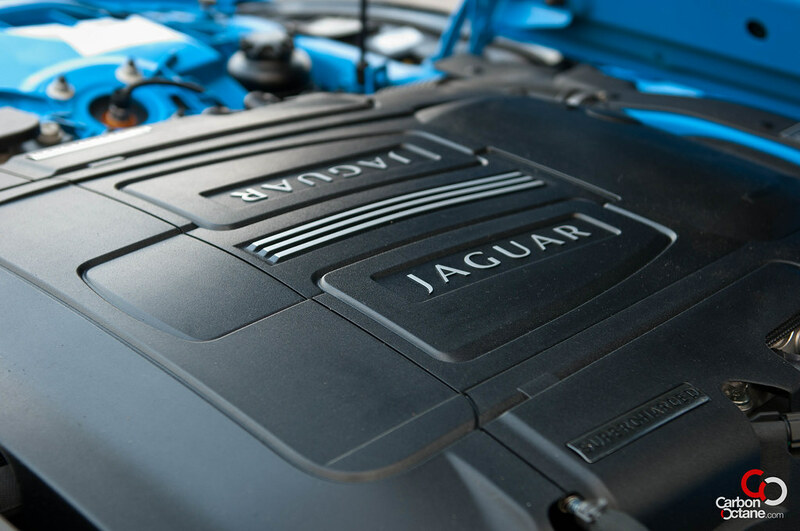 Its heart beats in the form of a 5.0L supercharged AJ-V8 Gen III R direct injection monstrosity, developing 542bhp and get this, a tarmac shredding 680 Nm of torque. I just feel sorry for the rear tires and the traction controls never-ending battle in finding grip through its rear 295/ 20 profiles Pirelli P Zero tires. 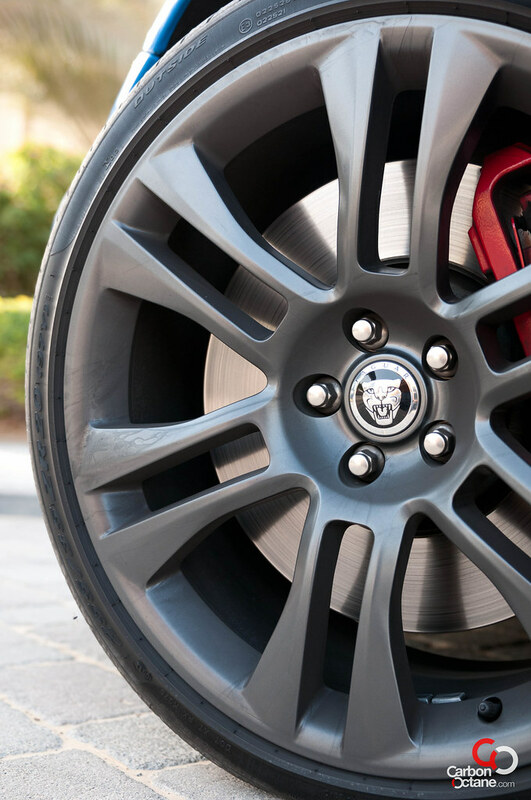 There is weight reduction in every aspect of the R-S’s production, from the light-weight aluminum chassis construction to the wheels; a 20 inch Vulcan lightweight forged alloys shedding 4.5 kgs of unsprung weight. 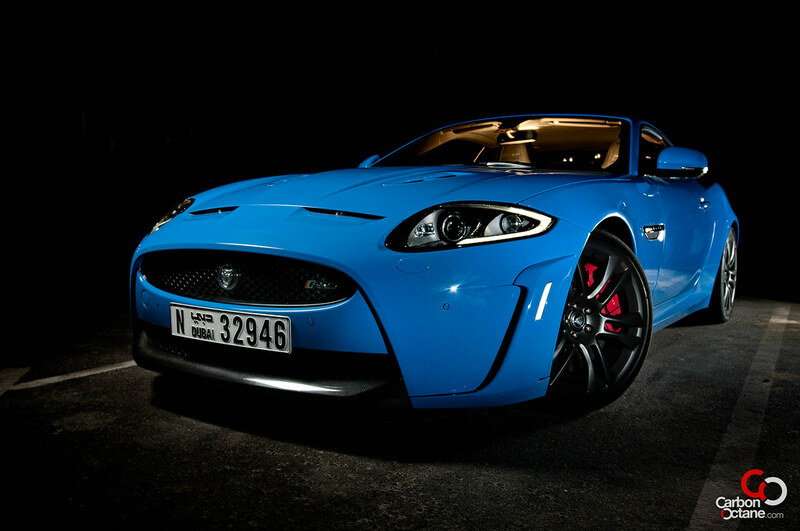 The Jag is not a big burly person being trained for a sprint, it is an athlete being trained for the sprint. One cannot be feather light as well otherwise a lift off at high-speed is imminent. 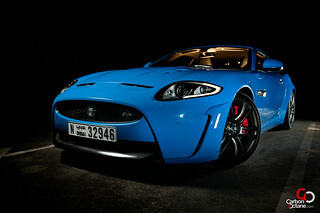 This is solved by extending the side stills on the front bumper and lowering the car by 10mm from its sister the XKR. 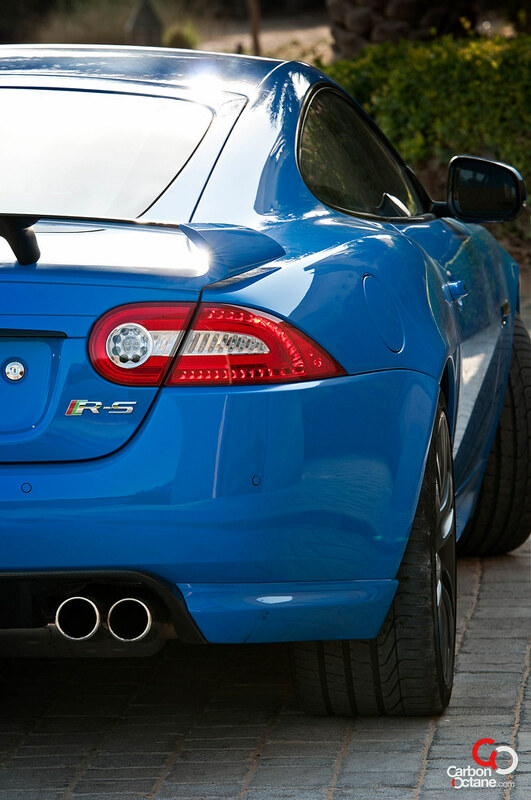 As a result the XKR-S feels as planted on the road at extreme speeds as a bulldozer feels while stationary. The designers have even re-calibrated the steering to reduce any delay in its response, this is the ultimate mans toy. A beast disguised in the body of Michelangelo’s David. Our test mule came with, what I think, their most striking color scheme ever. 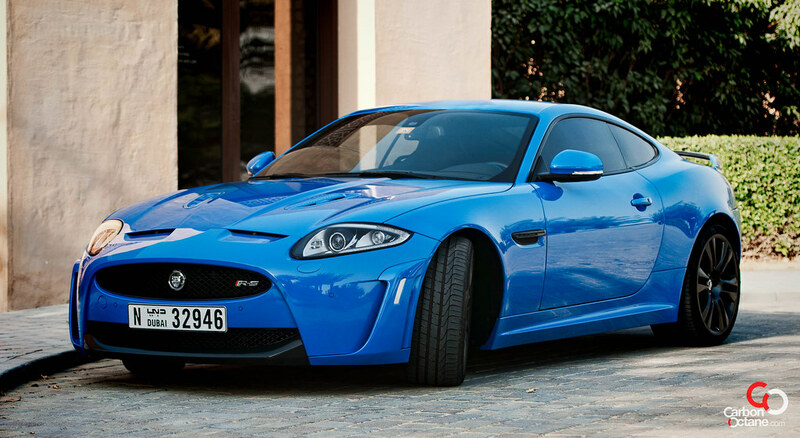 The French Racing Blue, a tribute to Jaguar’s racing heritage. Carbon fiber front spoiler and rear diffuser adds to form and functionality of the car and so does the rear spoiler which has carbon fiber elements as well, quite similar to that of the GTR but not as big. How fast can one get familiarized with the cars controls then? Well first, this is not a complicated car at all, the moment you sit in it and look at the controls, they become instantly familiar. The lack of a complicated toggle switch to control the media, air-conditioning, GPS is actually a welcome sight in a car such as this. Surprisingly the gear box lever is absent, and what we have here is a dial that turns to switch between the drive modes. This takes some time getting used to, for example in a tight parking, switching between drive and reverse I managed to turn it all the way to park quite a number of times. 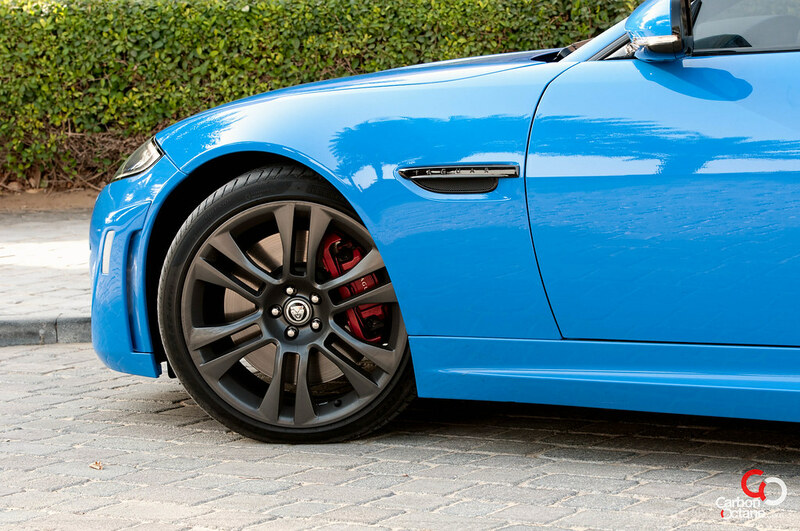 This however is incorporated in all of Jaguar’s line up. 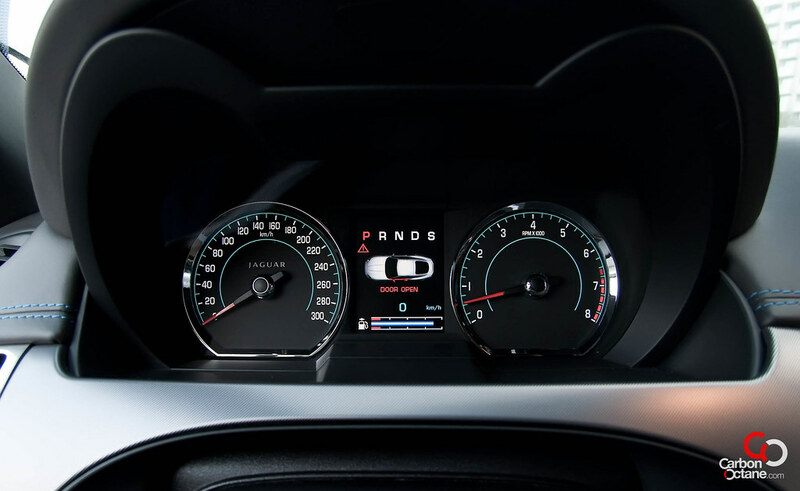 The dashboard is simple and gives you only three pieces of information, the speed, rpm and the fuel gauge. Short and sweet, the toggle switch will also display info such as temp, mileage, range, the normal stuff we come to expect from cars these days. 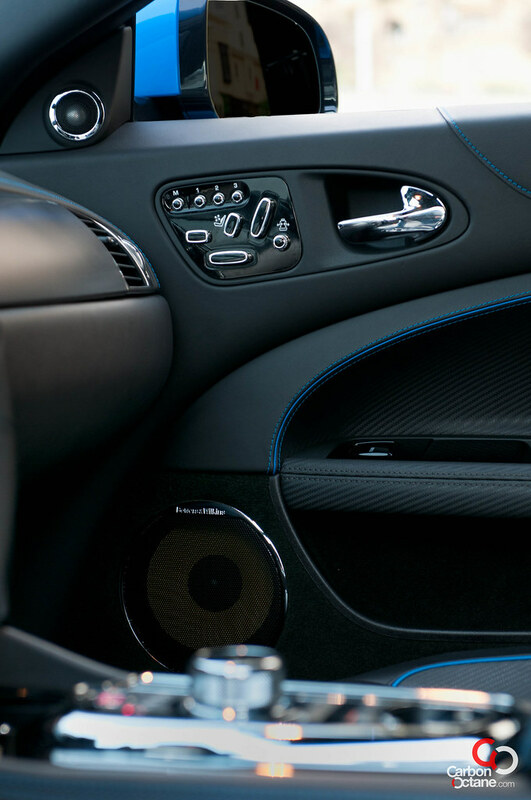 The interior, roof and everything around is draped in leather and carbon fiber effects with blue contrast stitching. The lumbar support has an adjustable pneumatic adjuster to strap you firmly in place for those hair-raising drives, much like the old Reebok Pump shoes while making a nice hissing noise once deflated. Well it’s time to fire up the engine which is done by pressing the glowing red start stop button. Once that’s done, the car comes to life with a growl which could be compared to the angry snarl of a sleeping beast who has rudely been awaken. Putting the gear on ‘D’, the car drives just normal, without any hint of the cars sporting heritage. The low down torque, and there is an unlimited amount of it, really helps in pushing the car out with the gear shifts operating smoothly unlike other super cars. 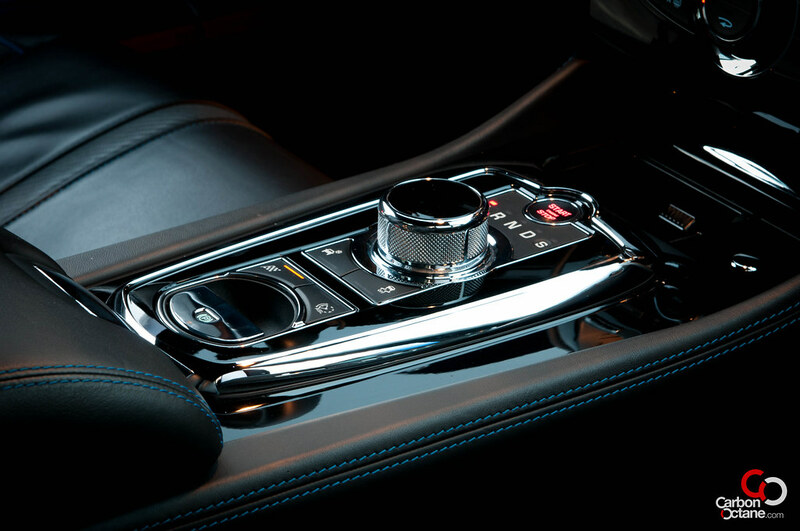 The Jaguar uses a conventional automatic gearbox rather than the dual clutch system as seen in the GTR and the R8′s which while providing smooth gear changes but it does so with a slight lag. But who wants to drive this beast in ‘D’ mode, there is this button with a chequered flag emblem, that looks like fun! Keep it pressed for a sec and it engages. What we have done here is essentially turning Dr. Jekyll into Mr. Hyde or in car terms, it’s KITT in super-pursuit mode. This is the effect of the cars dynamic mode with a checkered flag to remind us to hold on to dear life. Floor the accelerator and the rear end starts fish tailing due to its enormous torque hammering at the asphalt. The exhaust comes to life with a thumping soundtrack of the V8, a sign that we have awoken the beast from its slumber. I really don’t need the internal sound system, courtesy of Bowers & Wilkins, the exhaust note is music to my ears and it adds the thump and bass which syncs to my accelerating heartbeat. The acceleration feels like being strapped to a giant sling and let go, the tachometer rises faster than one’s mind can comprehend. 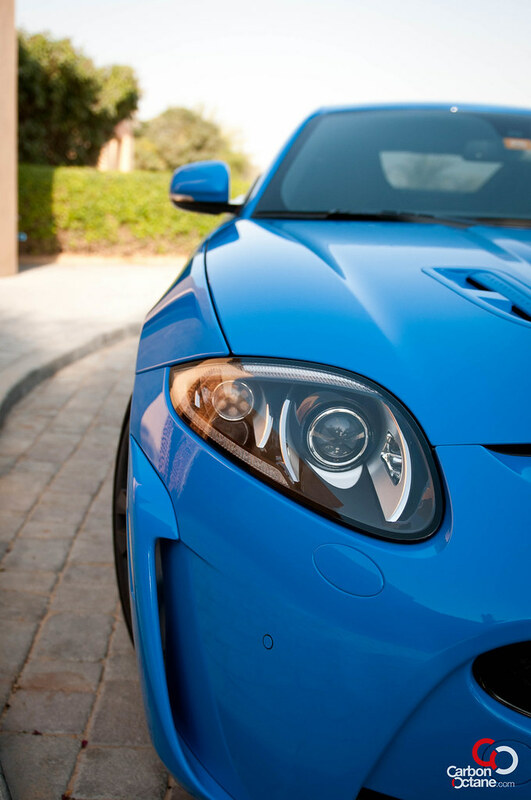 The XKR-S just takes a blink of an eye to shoot past the legal speed limit. The hardest part is keeping the car below the speed limit. It does everything so effortlessly and so instantaneous that we really need to set a max speed limit on this car. For those who are interested, this car will reach 300 kmph. 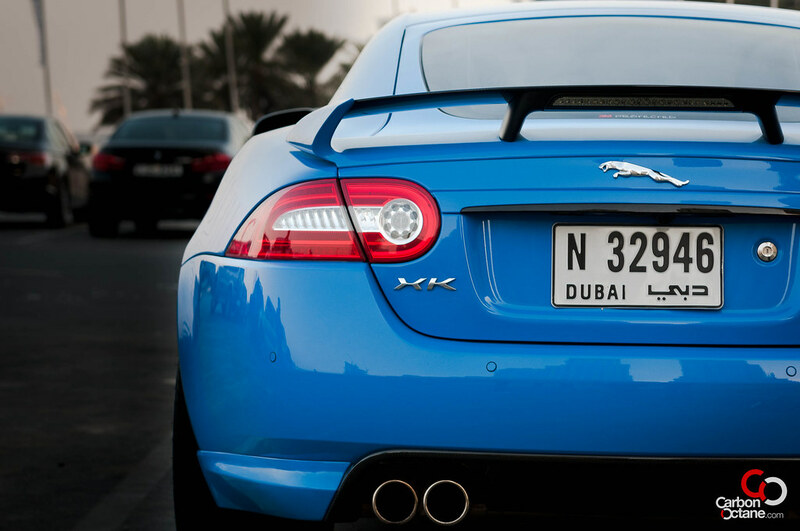 Coming out of a bend and gassing it, the Jag ploughs through like a bat out of hell. It makes a synaptic connection right to our adrenal glands making us sweat, salivate and gives us goose bumps. This car in essence makes our chest hair grow each time we drive it. You need to work at it however, it won’t correct your mistakes, disrespect the car and it will chew you and spit you out. It’s like riding a wild ox on a rodeo and there is nothing to hold on to. The primal instinct kicks in and we love it. Did I mention about the exhaust note, do I even call it sound, it’s more than that. It’s an orchestra of pulsating bass that feels like the thump we feel deep in our chest after a fast sprint. 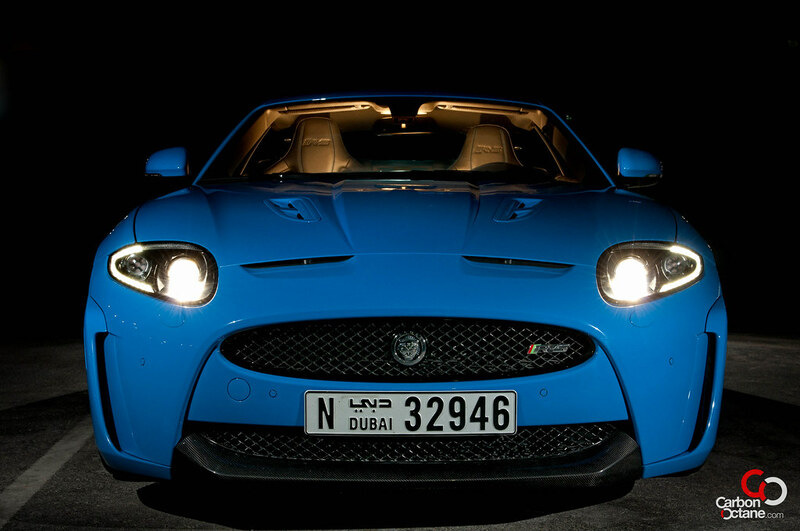 This Jag is more alive than any living creatures out there. Horsepower is nothing without a light weight tuned chassis to control the power. The cars figures show 309bhp/ton. It’s very similar to the R8 and the GTR at 308 and 304bhp/tonne respectively. This figure really shows of Jaguar’s confidence in its 0-100 claim of 4.2 secs. I think Jaguar was being very conservative about it. Just take the car and test it yourself. If Iron Man’s preferred vehicle is the Audi R8 with its chiseled and technological power pack then the XKR-S would be Thor’s ride, an apt ride reminiscent of his mighty hammer. For now I need to find Ian Callum’s number and congratulate him on this lovely yet outlandish show of force. 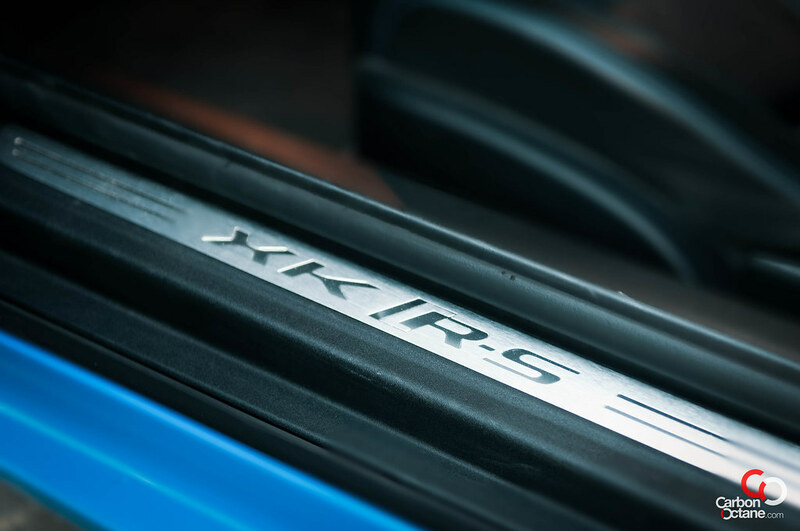 Yes the XKR-S truly is a sensory overload and with a price tag of almost AED 600k it also smashes our dreams of owning one, except for the lucky few.